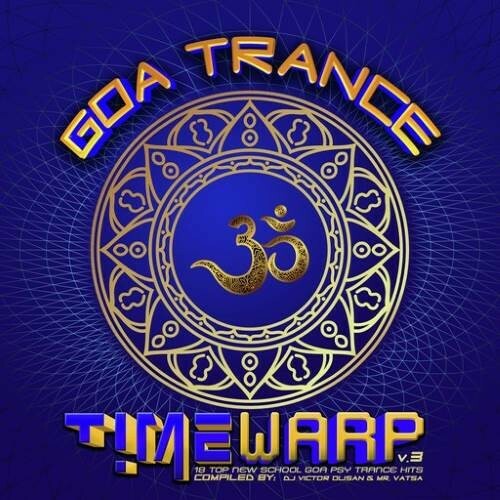 Timewarp Records is excited to present volume 3 of the successful and highly sought after series 'Goa Trance Timewarp'. Each episode is compiled by a guest resident of the Timewarp label DJ team and this time we welcome two top selectors DJ Victor and Mr. Vatsa. Also important to mention special thanks to Goa Records for supporting us to migrate this series to our catalog sequence with a very special 64th release. Everyone who loves Goa Trance knows that 604 spells the word GOA with numbers, and so this had to be extra special. Packing 18 top tunes into nearly 160 stellar minutes of mind mending, time warping, space bending, soul soaring adventures is what we were born to do! We hope you have as much fun as we did, dancing around the studio making this new album for you. Also to note is the awesome 3D graphics by Goa Doc. Please welcome our two seasoned Goanaughts with this epic 2CD release. DJ Victor Olisen - Born in 1988 in Belem (Brazil), met electronic music in 2004 and in 2006 got its start as a DJ. His first musical fountain was dark trance, but always had the admiration and curiosity to know more about Goa trance and in 2013, began researching more about Goa and presented to the public these two styles. He has performed in various cities the north of the country and some cities in the Northeast, shared the stage with many national and international artists. In 2015 he was invited to enter the Belgian label Goa Madness Records and in 2016 joined the seal Croatian TimeWarp Records and Cosmodelica Records of the Republic of Macedonia. DJ Mr. Vatsa - Mr. Vatsa is a Goa Trance and Psychedelic Trance DJ born in Mexico in 1979, he has his beginnings as a Dj in 2002. His style is defined by the combination of classic and mythical sounds, reaching the freshest and most intense atmospheres that make the dance floor vibrate and bounce. Having been within the electronic scene a little longer than 20 years, and holding the EBM and Acid as his main genres of first contact, in the 1990s Mr. Vatsa's heart gets filled with sounds of the Goa Trance, having as the ultimate result love and passion for this genre. By the end of the 1990s, he becomes a co-founder of 'Semilla Virtual', a cultural and electronic event house in Mexico City. By 2014 he collaborates with Toxic Productions (Mexico), in 2015 he is invited to be a part of the roster of Timewarp Records (Croatia), in which he publishes two sessions like the first one in 2015, called 'Goa Chronicles 003', along with Cactus Arising from Greece and in 2016 the second one named 'Goa Chronicles 008', with Javi and SkoOma from Israel. In that same year he takes part in the roster of Cosmodelica Records (Macedonia) and in 2017 he joins the roster of VST records and Moom radio.